2010 marks the 30th anniversary of the untimely death of John Lennon, and will be the cue for a frenzied rush of releases in honour of a man who was always more than just one of the most famous group in the world, The Beatles. Here, Odeon Entertainment are swiftly off the blocks with a snappy 80 minute documentary directed by the legendary Tony Palmer. But, as with the plethora of other releases bound for high street shelves as the December anniversary approaches, does the end justify the means? In other words, is this an exercise in pointlessness or a genuinely useful tribute which fans will cherish? A documentary such as this starts from a pretty firm base. It is unquestionable that John Lennon was one of the icons of the 20th Century, a man whose skills as a songwriter and performer cut across generations and musical tastes. It is perhaps food for thought that his solo career lasted longer than the group that spawned him, that controversy seemed to dog him throughout both periods and that, despite everything, his talent as a wordsmith remained. This talent is amply reflected upon by a smorgasbord of interviewees- from George Martin (both in a studio and on Good Morning with Anne and Nick) to Paul Gambaccini (his usual measured, knowledgeable self with an enviable wall display of CDs to, one presumes, give his comments added gravitas). There is also input from Cynthia Lennon (whom John left for Yoko in 1968) and (not in the same studio, one hastens to add) from Miss Ono herself. John also appears, in newsreels with the other members of the Fab Four and in a succession of interview segments- the most intriguing with David Frost. Given the variety of interviewees, it is acutely disappointing that the documentary contains no Beatles or Lennon solo music whatsoever. Whether this is a rights issue is unclear, but it comes down to giving a fish supper without providing any aquatic vertebrates. In that case there may be other diversions (such as the accompanying wine), but here the magnetism of interviews- however fascinating- swiftly palls, and one is left continually wondering when Lennon’s talent may be heard rather than talked about. To be fair, the focus of Love Is All You Need isn’t so much on the songs as the man behind the songs (but that still doesn’t make it acceptable to produce something on Shakespeare which omits any dialogue from his plays). As the documentary draws to its close, the poignancy becomes almost unbearable, particularly in the 1980 footage of one young girl sobbing ‘John Lennon can’t be dead’, her grief leading her to deny the unthinkable. Paul Gambaccini offers us his thoughts on the dreadful moment in December 1980 when Lennon was gunned down: ‘we have to understand what a giant was taken from us by such a midget’. It is the nature of John Lennon- as man, as legend- that superlatives are not enough to describe his talent, words useless to sum up his genius. Ultimately, Love Is All You Need is a celebration that passes the time rather than inspires. Lennon’s career was such that any impressionable student should be engaged with at least part of it. Sadly, without the music on this occasion, the level of that engagement is highly questionable. 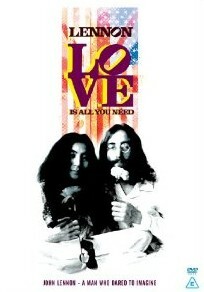 ‘John Lennon- Love Is All You Need' is available on DVD from Odeon Entertainment.